A chance to have some wet and wild fun, and to make a difference in a wonderful little community as well! We’ll “officially” kick things off at 8am and wrap things up at 1pm, but you’re welcome to join us at any time and help for as long as you can stay. We’ll be meeting at the St. Louisville Community Center (at the posted coordinates) and heading over to the North Railroad Bridge to start our clean-up effort. We’ll follow along the banks of that section of the river (about a 1 mile section), to wrap things up once we reach the South Railroad Bridge (both bridges are listed below under “additional waypoints”) and head back to the Community Center. 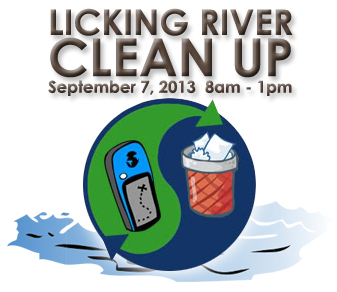 Bring some OLD clothes, gloves, and some water shoes/fivefinger shoes/old shoes (they will get wet). It should be a great time! And for those aquaphobians, there’s plenty of areas on the banks to clean up if you prefer to remain (mainly) dry.